Malta is sometimes called “The Land of Honey” and may have received its name from the Greeks, who called it melite, which means, honey or sweet. It is believed, it was given this name because of the honey bees that are endemic on Malta. Another theory is, the name came from the Phoenician word maleth, meaning haven or port. The origin of Malta’s name still remains a mystery. Malta is an archipelago in the Mediterranean Sea. Only three, of the eighteen islands, are inhabited. The largest island is Malta and home to the capital city of Valletta. Gozo is also inhabited but is much more rural than Malta. Comino is a tiny island that is mostly a nature preserve. Malta lies about 50 miles south of the Italian island of Sicily and 176 miles east of Tunisia and 207 miles north of Libya. The whole area combined is only 121 square miles. It is one of the smallest countries in the world, yet has a population of 450,000. This makes Malta the eighth, most densely populated, country in the world and the fourth in Europe. The spectacular, rugged, uninhabited islands, lie on the Malta plateau, which used to be part of a land bridge between Sicily and North Africa. They became separated when the sea rose, after the last Ice Age. Malta has significant history dating back to the 5200 BC. It is home to some of the oldest free standing buildings in the world, dating back to 3500 BC; all of which are UNESCO World heritage sites. Its location, in the Mediterranean Sea, has made it a strategic port, naval base and has been a target for takeovers by foreign powers for millennia. The Phoenicians, Carthaginians, Romans, Moors, Normans, Sicilians, Spanish, Knights of St. John, French and British, have all ruled the islands. Malta gained independence from the United Kingdom in 1964 and is a current member state of the Commonwealth of Nations. It is a member of the UN and the EU and became part of the Eurozone in 2008. In 1942, King George VI awarded the George Cross to Malta, in recognition of the country’s support and bravery during World War II. The George Cross is proudly displayed on the nation’s flag. Malta has a rich history as one of the oldest, Christian communities in the world. Malta is claimed to be an Apostolic see, according to the Acts of the Apostles. Paul, the Apostle, was shipwrecked on Malta in 60 AD, and spread Christianity. Saint Paul is memorialized throughout the island. The spot where most believe Paul’s ship ran aground some 2000 years ago, is a popular tourist spot. Catholicism is the official religion of Malta and a significant part of everyday life and holidays. If you visit Malta in the summer, every town and village has at least one feast (or festa’) dedicated to a Saint. The feast lasts for one week, and each village is decorated with ornaments, works of art, statues and painted tapestries. The festa’, typically culminates in a celebratory, fireworks display on a Saturday night. There are 75 of these feasts between June and September. The Maltese people also have many unique customs to celebrate Christmas on the islands. One of them is to serve a popular dessert called, Qughaq ta’ l-ghasel, which are pastry rings, filled with their special Malta honey. Malta is home to more than 360 churches. The parish church is the architectural and geographical focal point of every Maltese town or village. The Mosta Dome is one of Malta’s largest churches, known for its dome shaped roof, which is the third largest, unsupported church dome in all of Europe. On April 9th, 1942, during World War II, the Germans dropped a bomb weighing 500 kg, which broke through the ceiling while some 300 parishioners were awaiting mass. Miraculously, the bomb did not detonate when it hit the floor, sparing the church and all the worshipers. A replica bomb is on display in the back of the church. There are two official languages of Malta, Maltese and English, which was imposed by the British after 1800. Maltese is a Semitic language that is a combination of Arabic, Sicilian, and Italian, with a little French and English mixed in. The alphabet consists of 30 letters and is based on the Latin alphabet. One hundred percent of the population speaks Maltese, 88 percent speak English, 66 percent speak Italian and 17 percent speak French, making Malta one of the most multilingual countries in the European Union. Malta is home to only one university, the Maltese Cross, which was founded in 1592, making it the oldest university in the Commonwealth, outside of Britain. In 1530, Charles V of Spain, gave control over Malta to the Knights of St. John of Jerusalem, also known as the Knights of Malta. They are most remembered for successfully defending the island against the Ottomans during the Great Siege of 1565. The eight point Crusade cross, often associated with the Knights of Malta, later became known as the Maltese cross and is one of the nation’s most important symbols. The Grand Master of the Order of Saint John Jean Parisot de Valette, was the Order’s hero, commanding the resistance during the Great Siege. He laid the foundation for Malta’s capital city, Valletta. The economy of Malta is growing and has changed dramatically over the centuries. Today Malta’s major resources are limestone, its desirable geographic location and their productive labor force. The economy is dependent on foreign trade, mostly serving as a freight trans-shipment point, manufacturing of both electronics and textiles and tourism. 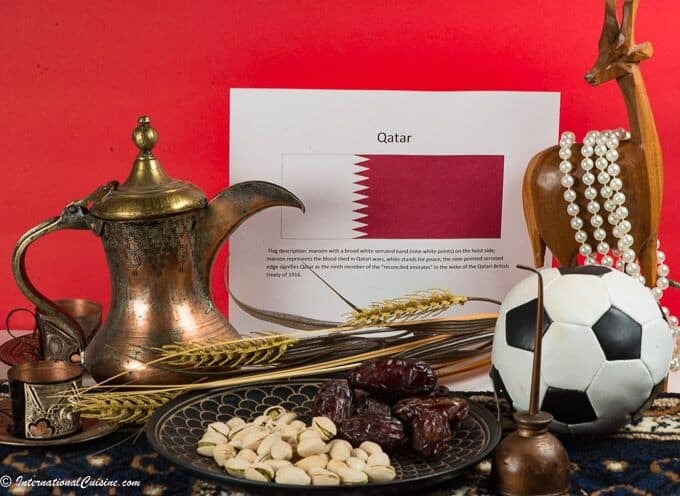 The country has been successful in attracting film production, the gaming business, aircraft and ship registration, as well as credit-card bank licenses. They are also looking at petroleum exploration of the continental shelf, between Malta, Libya and Tunisia. The country is listed as an advanced economy according to the IMF. It does face issues, as it only produces about 20 percent of its food needs. It also has very limited freshwater supplies, due to drought in the summertime. Additionally, there are no rivers or lakes, so they have to rely more and more on the expensive alternative of desalinization plants. As we look into the cuisine of Malta, it clearly reflects its rich history. Some of the most prevalent influences are Sicilian and English, with Spanish, French, Maghrebin and Mediterranean cuisines, thrown in the mix. The result is uniquely Maltese. Their national dish is called stuffat tal-fenek, a rabbit, stewed in wine and spices. They often utilize the flavorful broth from the stew to serve as a first course with pasta. They are famous for their Gozitan cheeselet, called gbejna, which is used in multiple dishes, as well as their crusty bread called hobz biz-zejt. They make a dip called bigilla, which is made from dried, broad beans that are cooked and mashed with anchovies, garlic and hot pepper. Another treasure from Malta is a sweet tasting, tomato paste called Kunserva, which is also used in many dishes and often times spread on crusty bread, topped with capers, tuna, anchovies, olives and then drizzled with olive oil. They may be most famous for their golden filled pastries found on every street corner, called pastizzi. We decorated with the county’s flag colors, of red and white. 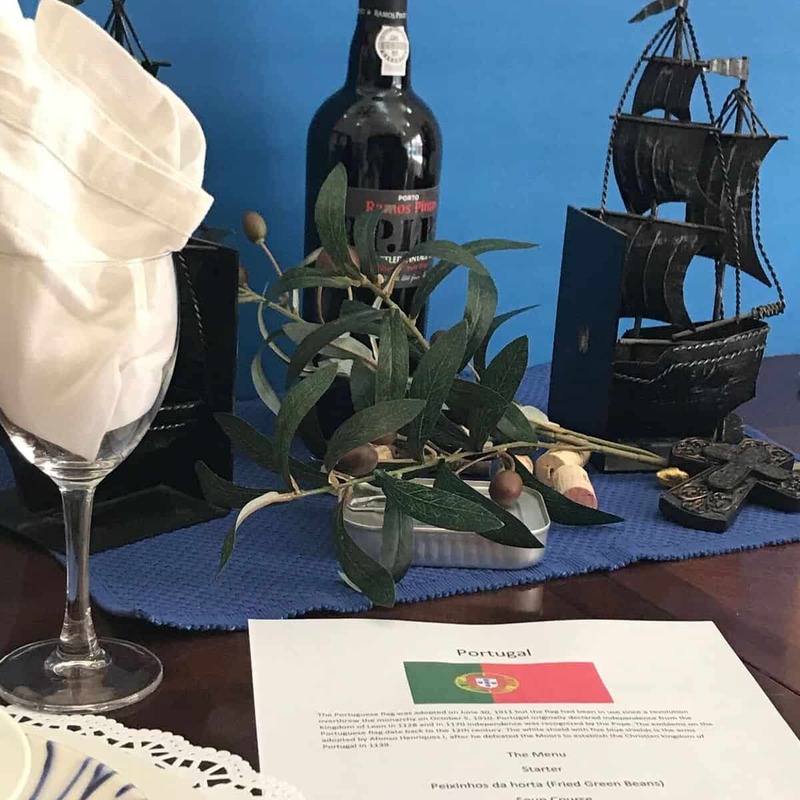 We adorned candles with the Malta cross, added ships to represent their port industry and a tennis ball, as some may consider it to be their national sport. Pictures of Mdina, a fortified city of antiquity, were placed, as well as Comino’s famous blue lagoon. 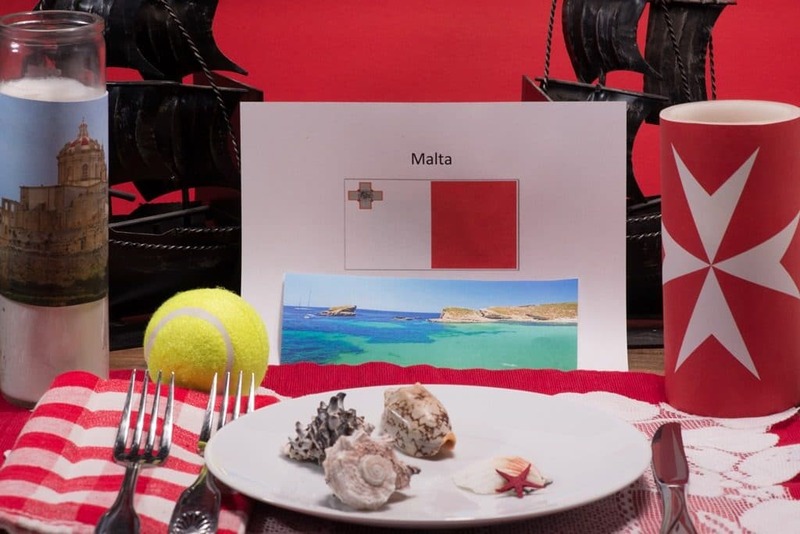 We sat back and imagined the beautiful rugged beaches, spectacular churches, fortresses and especially the strong character of the Maltese people, as we enjoyed our first course. We ate continental style, which is customary there. 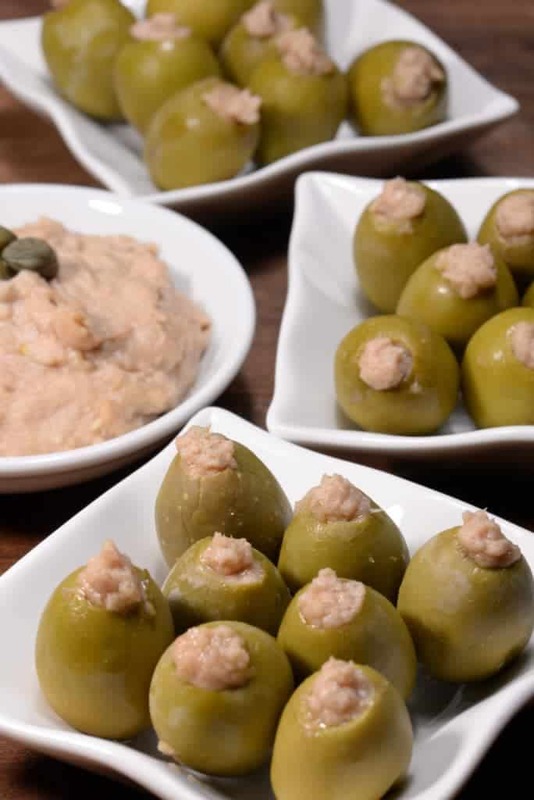 We began with two snack foods; the first was colossal olives stuffed with a mixture of anchovies, tuna, and garlic. They did not last long! We also enjoyed the extra stuffing mixture on crackers. These little treats are often served with cheese, salami and wine and would be outstanding for any occasion. We served ours alongside the national treasure snack, called pastizzi. 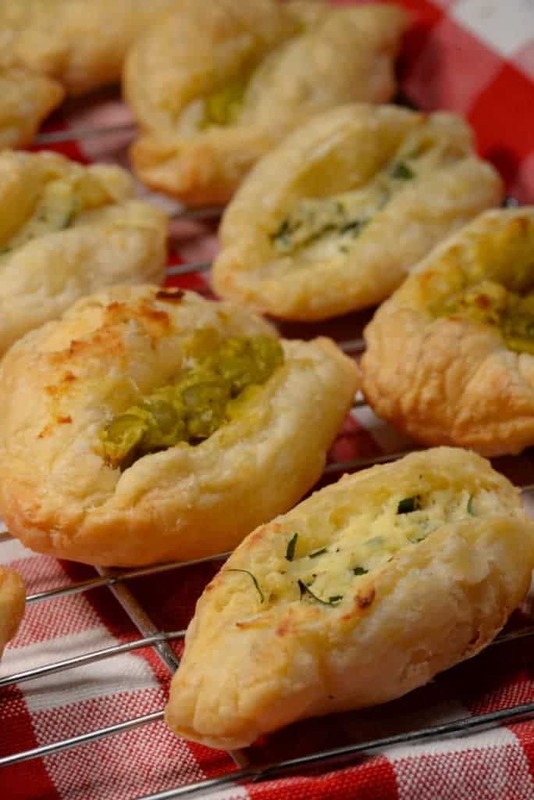 These are golden puff pastries: stuffed with cheese in one and stuffed with curried mashed peas in the other. We loved them both. 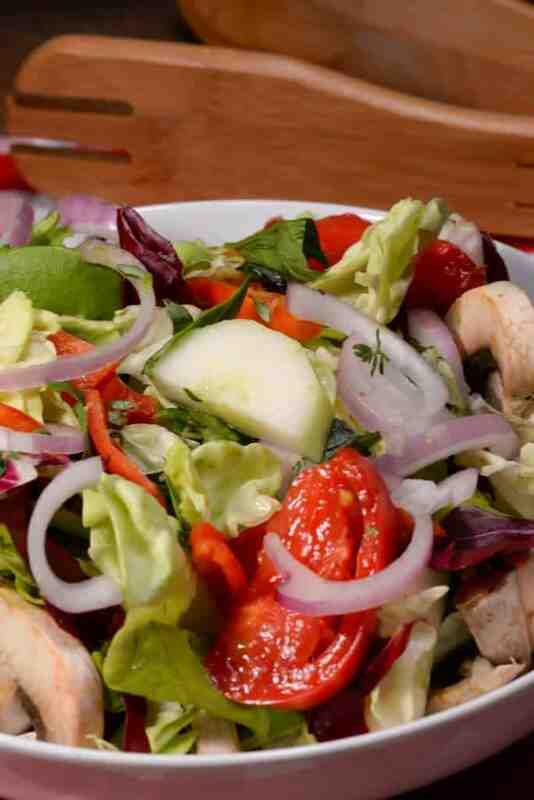 Next was a simple inslata, or garden salad, made with fresh ingredients right from our International Cuisine garden. It consisted of romaine lettuce, cucumber, sweet peppers, red onion, carrots, tomatoes then garnished with fresh basil and thyme. It was lightly dressed with olive oil a few drops of white vinegar, minced garlic and a touch of ground pepper. A lovely salad indeed. For the main course, we had Bragioli, or beef olives, as they are often called. But don’t let the name fool you; there are no olives in the dish. This is a very popular dish in all of Malta. 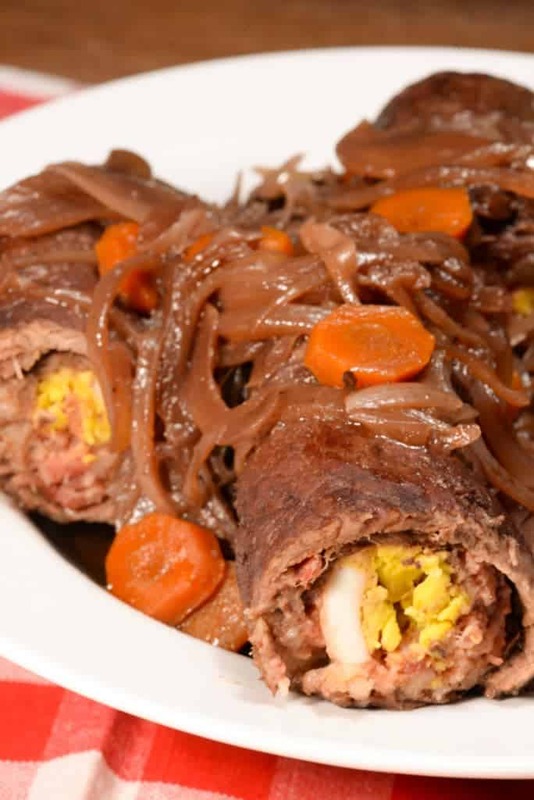 It is made with thinly sliced beef, rolled and stuffed with bread crumbs, bacon, garlic, parsley and hard-boiled egg. The beef olives are garnished with sauteed onions, carrots and a bay leaf, then slowly, braised in a red wine. The broth is often times used with pasta, as a first course and although we did not do that, I am sure it would be delicious. We did enjoy it alongside an outstanding, cheesy, pasta omelette. It is a wonderful way to use left over pasta and is definitely a keeper. 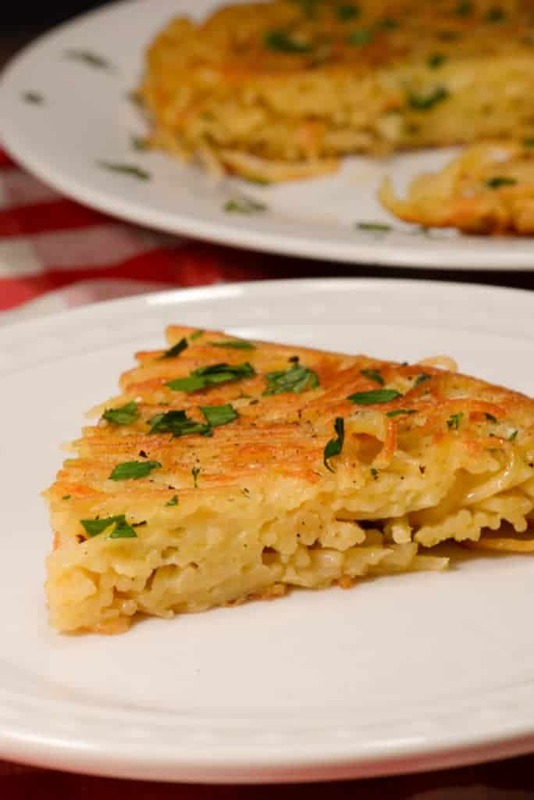 The cooked pasta noodles are lightly coated with cheese, egg, parsley and garlic, along with a little salt and pepper and fried until golden brown, just like an omelette. Ingenious! 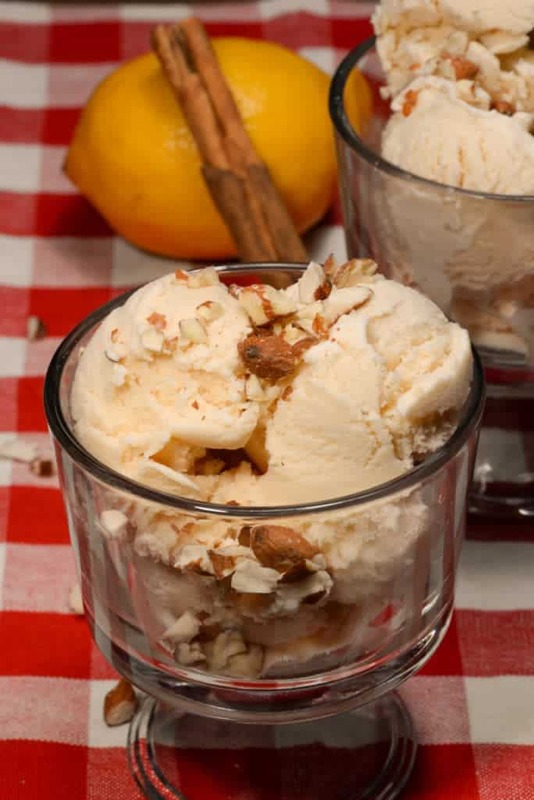 For dessert, we served a simple gelat, or vanilla ice cream, made with a bit of cream, evaporated milk and gently flavored with a hint of lemon and cinnamon. This , topped with a sprinkle of roasted almonds, was a lovely end,to our most satisfying Maltese meal. And a quote widely used by the Maltese people.